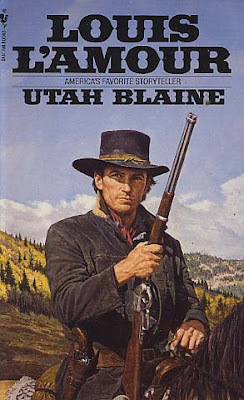 “Utah Blaine” is a 1954 western by genre heavyweight Louis L'Amour. It was originally released as part of an Ace double under the pseudonym Jim Mayo (the second book was “Desert Showdown” by Samuel A. Peeples as Brad Ward). In 1957, the novel was adapted for the silver screen by director Fred F. Sears and starred Rory Calhoun. The book, set in Arizona's Verde River Valley, introduces us to protagonist Utah Blaine in heroic fashion. Blaine, unarmed, listens closely as a vigilante army strings up rancher Joe Neal. Seemingly dead at the end of a noose, Blaine rescues Neal and learns he owns a large cattle outfit named The 46. After hiring a vigilant army to prevent cattle rustling, the valley's ranchers soon found the tables had turned – the army, greedy and chomping at the bit, selfishly wants the ranches. Blaine's reputation of slick gunfighter appeals to Neal, so the two come to an agreement to have Blaine run the 46 and fight Neal's battles for him. There's a large monetary reward and a head of 500 cattle if Blaine can get the job done. This is traditional L'Amour at his finest. At a brisk 164-pages, the novel is absolutely loaded with gunfights. In what seems like a “Game of Thrones” chessboard of ranches, Blaine shakes out a dozen or more characters, each with their own agendas, skill-sets and history. It's these characters that each represent alliances and historical feuds involving money, land and...shockingly...even pretty women. While often I had to keep a scorecard on the dead and still-living, this book was an exhilarating read. L'Amour's silver star shines bright with “Utah Blaine”. Sounds good to me. I just finished the first Sackett book, about Barnabas Sackett, and liked it. I really enjoyed that first Sackett novel. The locations of England and North America were utilized perfectly. Such a great American saga. One of his best.